The fact that the Asia-Pacific region hosts both the most and least efficient economies in conducting international trade transactions is generally well-known. However, information on the actual implementation of specific trade facilitation reforms in the Asia-Pacific developing economies is generally lacking. 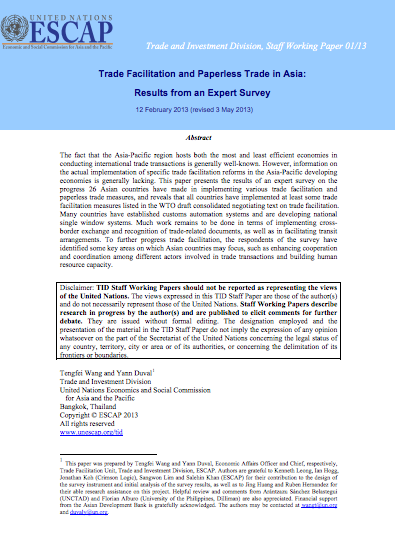 This paper presents the results of an expert survey on the progress 26 Asian countries have made in implementing various trade facilitation and paperless trade measures, and reveals that all countries have implemented at least some trade facilitation measures listed in the WTO draft consolidated negotiating text on trade facilitation. Many countries have established customs automation systems and are developing national single window systems. Much work remains to be done in terms of implementing cross-border exchange and recognition of trade-related documents, as well as in facilitating transit arrangements. To further progress trade facilitation, the respondents of the survey have identified some key areas on which Asian countries may focus, such as enhancing cooperation and coordination among different actors involved in trade transactions and building human resource capacity.